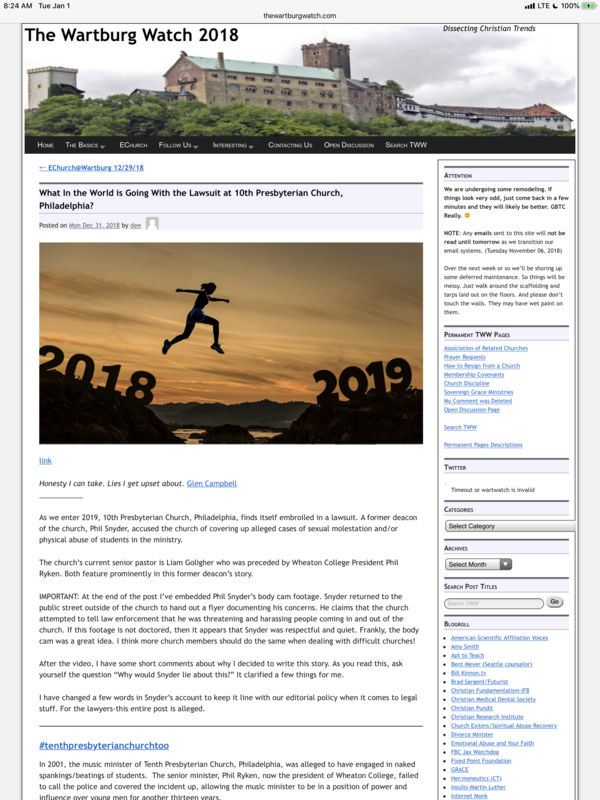 In a move reminiscent of Grace Episcopal Church, Dysfunctional Bob Malm, and Sugarland Chiow, Tenth Presbyterian in Philadelphia allegedly has attempted to ban a protester in front of the church by claiming that he has threatened and harassed people. The protester, Phillip Snyder, asserts that he is protesting the coverup of sexual abuse by the church’s former music minister. In response, Mr. Snyder has filed a federal civil rights suit under 18 USC 241, alleging that church officials committed perjury by claiming he was threatening. He appears to have video cam evidence to support his claim. In the meantime, I am in touch with Mr. Snyder and hope to talk with his attorney later this week.